Hands Up! ChildFund’s Recent Visit to Scoil Chaitlin Maude, Dublin, Was A Huge Success..
ChildFund had the pleasure of visiting the school as part of our Show of Hands Campaign – An Initiative designed to promote children’s rights. 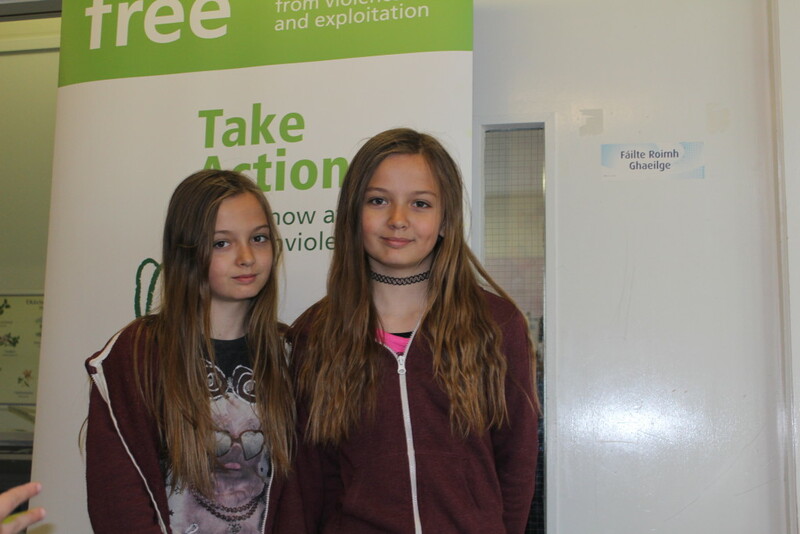 We also interviewed children for our annual Small Voices Big Dreams survey, on what they see as important issues affecting them. Our recent visit to Scoil Caitlin Maude was both a great success, and a fun day out. It was great to see the children so full of enthusiasm and a genuine appetite to get involved in our work to promote global understanding of children’s rights. Our staff members, Deirdre, Clodagh & Brian were given fantastic cooperation and support, at what we know was a particularly busy time in the school year. 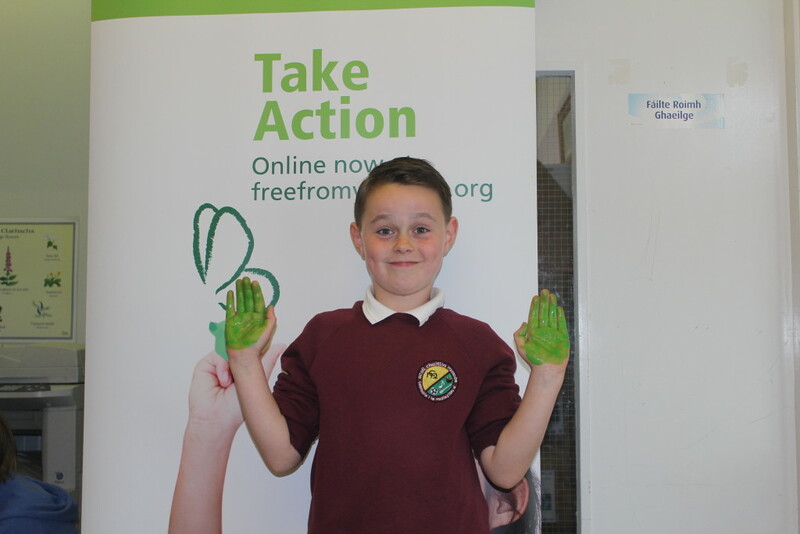 The Show of Hands campaign is designed to be a fun way to engage children in the promotion of their own human rights. Children in schools across several continents have been asked to make prints of their hands in the shape of a butterfly. Why a butterfly? In cultural myth and folk lore, the butterfly is a symbol of transformation, and also representative of the soul. It is also closely associated with children. In the western world, the symbol of the butterfly stands for freedom, fun and joyous times. It also evokes “the butterfly effect,” meaning that small efforts made by individuals can cumulatively make an enormous difference. We hope that this campaign will transform the world for millions of children suffering from violence and exploitation. The prints are being collated by our colleagues in the US, and digitised for showcase on a new promotional website,. The website will include copies of the hand prints and photo’s, as well as an interactive map. 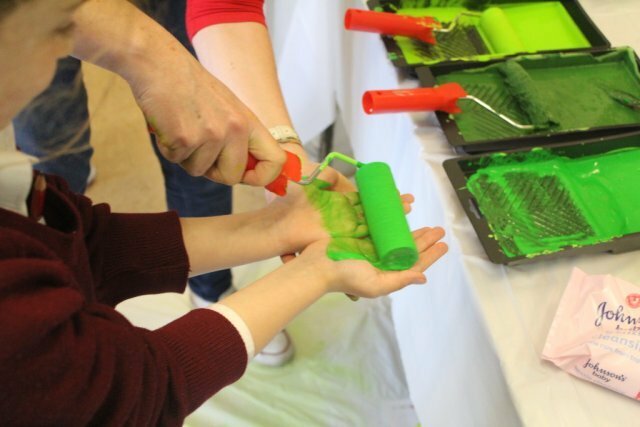 Roll up for more paint! 2015 is a hugely significant year for Children, with the international community set to affirm a range of priority goals – goals that are designed to help end human suffering, improve the quality of life for those most disadvantaged, and remove global inequality. Through our successful Free From Violence campaign, ChildFund has lobbied tirelessly at UN level, for the inclusion of specific goals that will directly affect children. These goals will form the basis of binding commitments from the international community later this year. The copper-fastening of these targets will help protect children from future harm, exploitation and abuse. It will enshrine their human rights and give them agency, in a world where their voices are often marginalised. We would like to offer our appreciation once again to all the pupils and staff of Scoil Chaitlin Maude, and in particular, we would like to say a big thanks to Sarah Rooney for her time, energy and enthusiasm – Thank you Sarah! 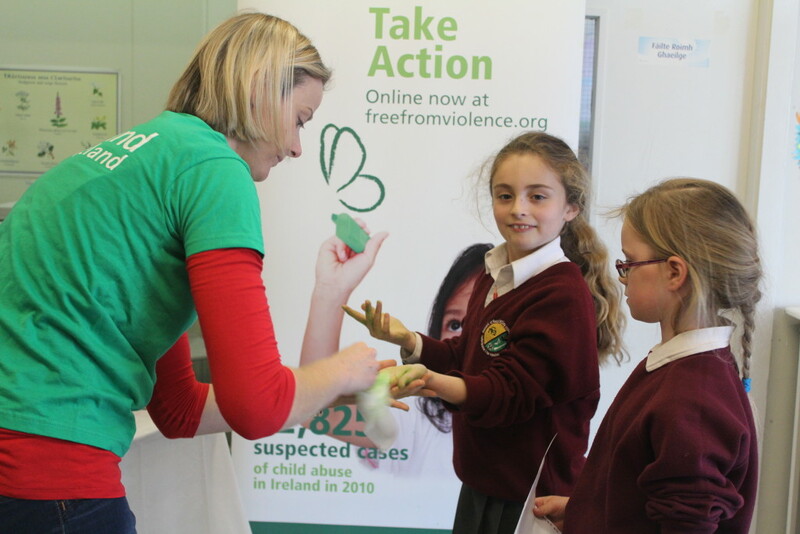 You Are Here: ChildFund Ireland > Blog > Hands Up! ChildFund’s Recent Visit to Scoil Chaitlin Maude, Dublin, Was A Huge Success..